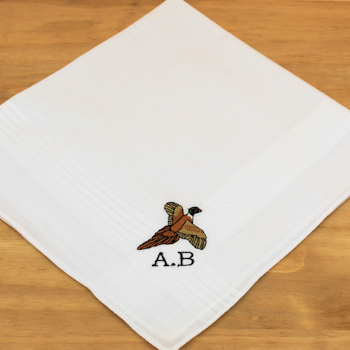 Superb pheasant motif embroidered gents cotton handkerchief with personalised initials monogrammed in a thread colour of choice. Select from a single hanky or a gift set of 3 mens white cotton hankies. Personalised with a name or initials and a flying pheasant motif. Great gift for for countryside animal lovers. Unique and one of a kind!